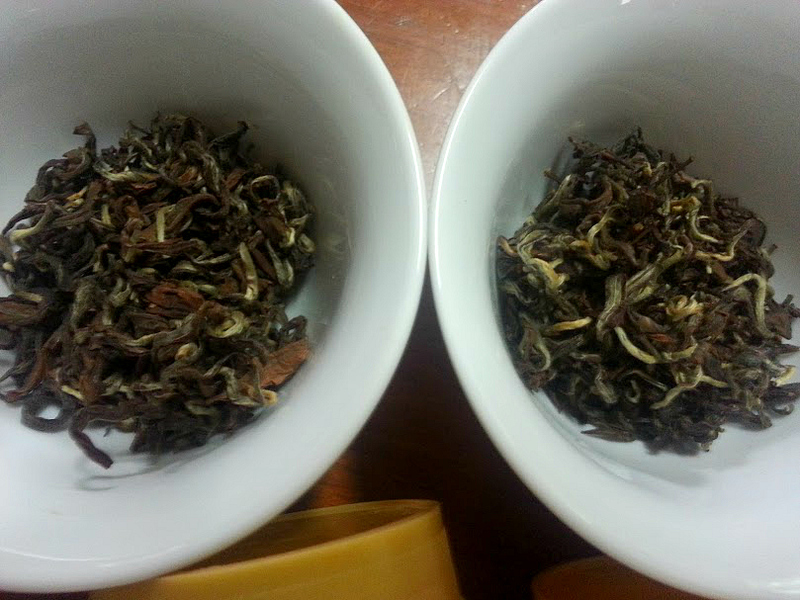 I'm comparison tasting Rohini Enigma and Enigma Gold. These are good teas. They're completely different than the lighter style of the first flush versions I've been reviewing, reminding me a little of the effect of Oriental Beauty, a nice range. 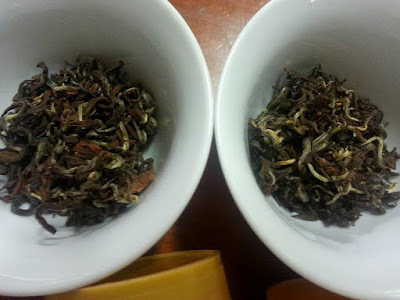 Both are a bit more oxidized than typical lighter Darjeeling first flush styles but not completely in the range of black tea, maybe not as oxidized as second flush teas tend to be, but then styles vary. They really don't remind me of a second flush tea in terms of other aspect character either. The citrus element could relate to muscatel, although it seemed different to me, a bit lighter and brighter, and there's quite a bit of bright fruit range. 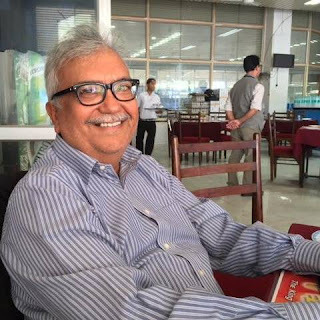 The Gopaldhara site, that lists some versions produced by Rohini, a related plantation, doesn't list these. I'll say at the end what it is, and what the producer mentioned about it, but for now I'll leave it as a riddle wrapped in a mystery. The Enigma version is nice. The base flavors are warm and sweet, with light, clean earthy aspects, with a bit of bright citrus balancing that. One taste aspect is just a bit off cinnamon, maybe in between cinnamon and nutmeg. Fruitiness is hard to summarize, complex, a bit like cooked mango, but with more range. It all really works. The Enigma Gold pushes all that to the next level (although of course that's partly my interpretation; they're similar but not the same). There's one taste aspect that really takes me back: teaberry. Those grow wild where I'm from--in Pennsylvania--and nothing has ever tasted like that, until now. That taste is bright and sweet, and distinctive. It tastes a little like those sweeter tones in the old scratch and sniff kid's products, which I haven't seen for a long time. There's a lot more going on than just teaberry. The aspects set takes what the Enigma version was doing and extends it. One part is a little like cinnamon, and another a brighter citrus tone. A bit of mineral balances all that, not presented as astringency, not even as feel or structure; it's in the range of taste. It gives up a little of that cooked mango fruit range for adding those layers but has more going on, and is probably a little fruitier, just in a different range. On the next infusion the Enigma doesn't transition much, still well balanced, not different. The feel is nice, with good lingering flavor after, even brewed lightly. That mango aspect reminds me a little more of pineapple this time, a little brighter. It definitely includes citrus too, just not as heavy as muscatel typically comes across, in a lighter range. I could guess an orange type to attribute it to but that would just be making something up to get an idea across: blood orange? The warmth picks up in the Gold version. How those aspects balance really can't be described, it has to be experienced, but of course I'll start in. It shares some of the feel of a lighter black tea, more in a Chinese style range, but it's not exactly like that, with a brightness and complexity coupled with flavors depth and range that only compares to Oriental Beauty (Taiwanese oolong, Bai Hao, Dong Fang Mei Ren, you know). If this was sold as a Darjeeling attempt at OB it would seem like they had some success with matching that style, or at least in interpreting it. It wasn't; I'm just using that to help explain it. The set of flavors--citrus, spice, other fruit--is the same, and the mid-level oxidation isn't far off either. This must be slightly less oxidized than a typical OB (70-80% oxidized for those, as I recall, as much as specifying that even makes sense). Brewing these a little longer to keep the intensity up--on the fourth infusion--the mineral and earthiness of the Enigma extends to a light dryness, picking up a trace of wood, but it still works well. The sweetness and citrus balances those aspects. The citrus aspect still isn't completely different than muscatel, maybe drawing closer, but it doesn't seem identical to that, to me. The intensity of the Gold version picks up, brewed a little longer, along with the mineral element and feel. Brewed stronger these resemble black tea more, but per my preference their optimum is to be prepared a little lighter. It's not as if you need to work around astringency or bitterness, they would be fine prepared in different ways. It is strange to prepare them Gongfu style in the first place but as I keep saying it's just the page I'm on now; it's interesting to keep messing with that. With transitions a bit limited it wouldn't change much to use Western style brewing, although I'd expect the aspects range to shift just a little based on even a minor parameters change. A tea like this one would probably change character quite a bit brewed at different temperatures, for example. The Enigma tea was nice, unique, positive, well-balanced, with great characteristics, it just suffered a little in comparison since the Enigma Gold had just a little more going on. The Gold was a little fruitier, slightly more complex, with a little more spice, a combination that was interesting and positive. Both were great teas, not exactly like any others I've tried, but the Gold really stood out as something different. 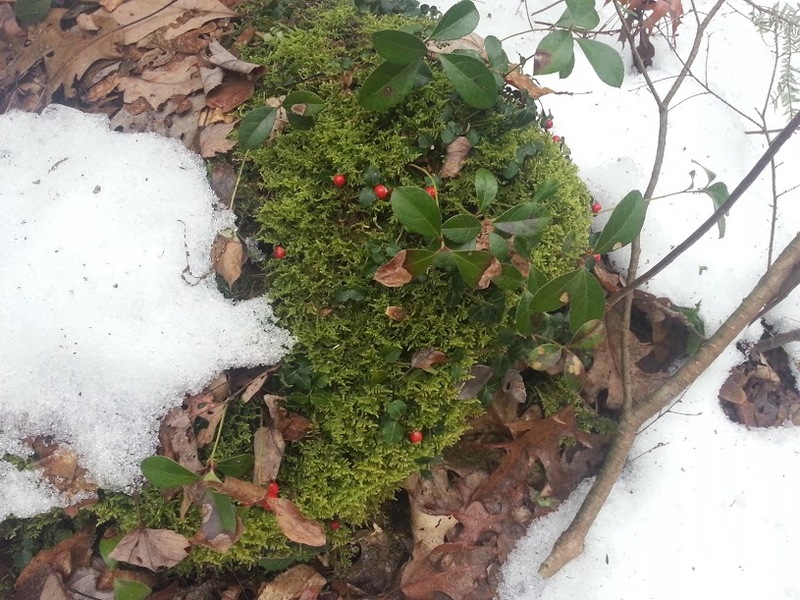 The fruits of G. procumbens, considered its actual "teaberries", are edible, with a taste of mildy sweet wintergreen. The leaves and branches make a fine herbal tea, through normal drying and infusion process. For the leaves to yield significant amounts of their essential oil, they need to be fermented for at least three days. White-tailed deer browse wintergreen throughout its range, and in some localities it is an important winter food. Other animals that eat wintergreen are wild turkey, sharp-tailed grouse, northern bobwhite, ring-necked pheasant, black bear, white-footed mouse, and red fox. 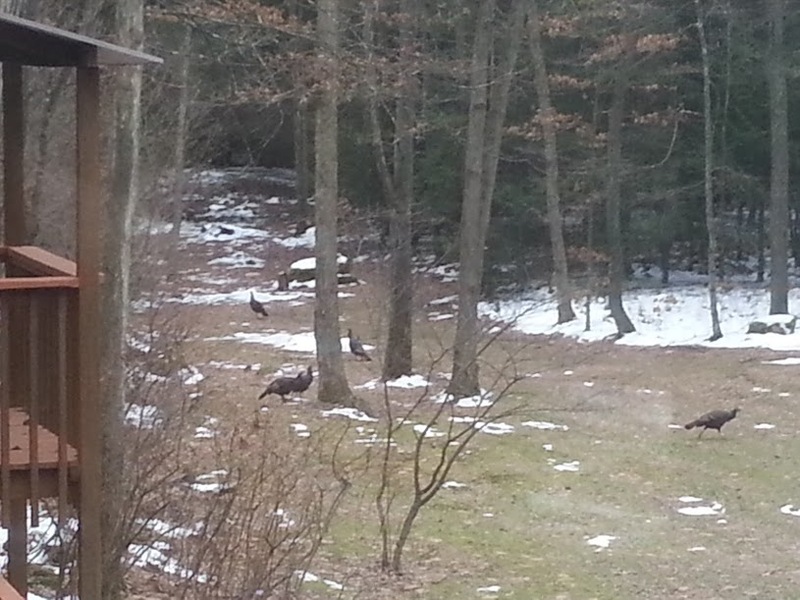 Those turkeys might have been snacking on it. It is tasty; I ate a few of the berries that day too. Per the Gopaldhara manager the harvest timing is really in between first and second flush. These are made from AV2, the plant type I'm familiar with from other Gopaldhara types, capable of making some amazing, soft, fruity, complex teas. The preparation style seemed in between what's typical of first and second flush to me as well, which was interesting. According to him the oxidation level is unusual, more medium than is typical, low for second flush. You just never see that much fruit and that much spice from the same tea, unless it is a Taiwanese Oriental Beauty, and then that would be typical. Enigma is made in 2nd Flush from AV2 leaves. 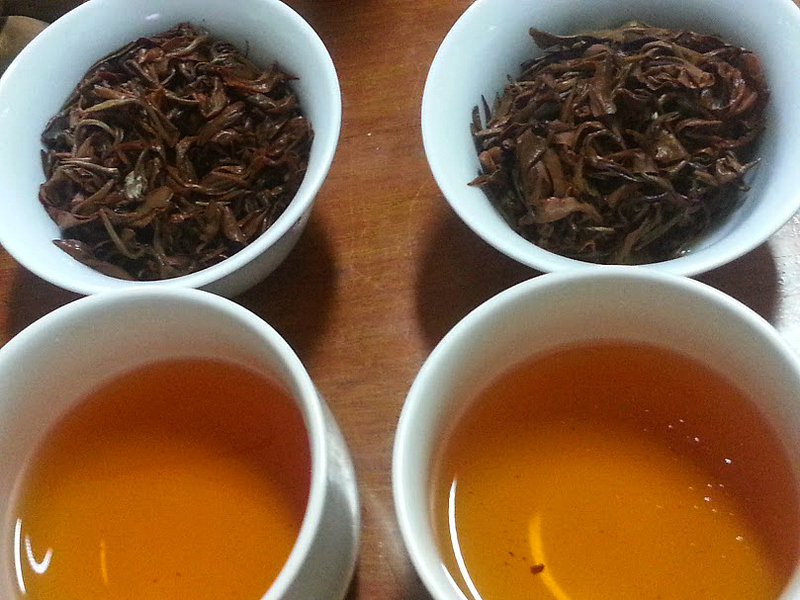 Unlike other Darjeelings, it is lightly rolled in small batches in China rollers to avoid heat generation and prevent the cup from being opaque and coloury. I visited Taiwan and imported oolong machinery including a panner, from there. Prof Kunzo Sakata, of Kyoto, Japan, was trying to get us to produce OB teas in Darjeeling. 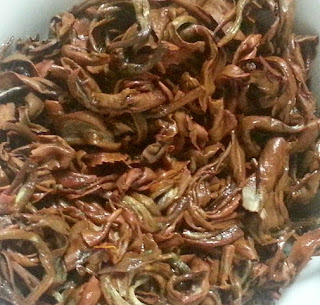 The withered leaves are fixed before rolling and final drying is also done in a panner. Enigma Gold, is slightly lighter withered, for a more coloury cup and is made from leaf from section no 5, AV2- higher elevation and weaker bushes due to poor soils. Fascinating stuff! Some of that would mean more to me if I actually made tea but it's still interesting. In further discussion he confirmed this production processing is still far removed from that of oolong, but per this input it draws on processing experimentation and equipment use from different sources, and lots of experience. Based on drinking those teas it all seemed to work out nicely.